The group can provide a sounding board to work and grow with. 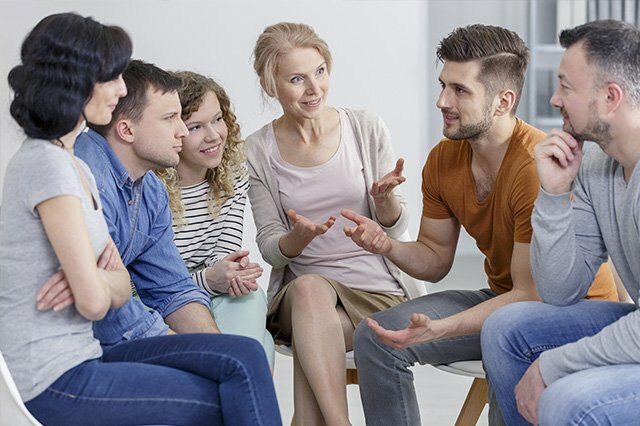 Our groups are led by Haven House therapists who have a desire and passion to work in the group setting and have the expertise and a focus on a specific topic. Discover greater self-awareness around their anger. Discover anger prevention techniques and strategies. Groups meet in 6-week cycles. A certificate is awarded upon completion of all 6 sessions. We meet on Tuesdays – afternoon or evening sessions are available. Share a meal with your family. And to focus on topics that teach and reinforce healthy family relationships. Parents, grandparents, and children join in together to address topics like healthy communication, child development, special needs, and recognizing feels of anger. This group is ongoing and meets year round. New participants may join in at any time. We are open to providing you with outstanding support and understanding as you begin your grief journey. We invite you to connect and share with others who have experienced a loss and develop the skills needed to begin healing. This group meets weekly, on Fridays, and will continue to year round. New participants may join in at any time throughout the year with welcome sessions on the first Friday of the month. Cost: This program is currently open to Haven House clients only and is covered by insurance. Our peer support group meets every Wednesday, 3:30 pm – 5:00 pm, in the Haven House café. Anyone from the community is welcome to attend. You don’t have to be a Haven House client. The group discusses issues of concern for individuals in the group, shares resources, and plans future activities to enrich the lives of the participants and to encourage all in their continued recovery.